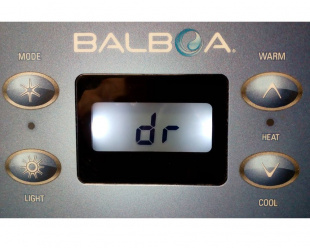 All hot tubs are equiped with a way of detecting that there is water flowing through the heater. This is a safety system to make sure that the heater doesn't overheat, potentially burning out the heater, or even a causing a fire under your spa. 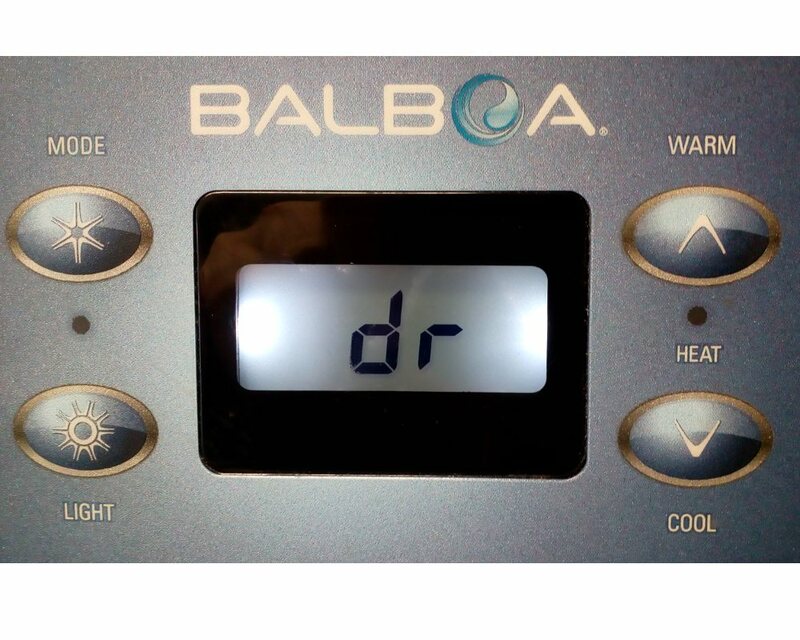 If the control system thinks that there is not enough water flowing through the heater to heat safely, it will shut down power to the heater, and you'll most likely see an error message on the display screen. Different systems use different messages, but some common ones are FLO, FL, LF, dr, drY, PS, FL1, FL2 or Error4, depending on the model of the control system installed. On older Gecko systems, this kind of problem is indicated by three flashing dots on the screen. Dirtyfilters Remove the filter. If the message disappears, clean or replace your filter. Lower water level Check the water level. There may be a mark on your skimmer for the ideal level, but the main thing is that there shouldn't be any air being sucked through the skimmer. If you find the error shortly after changing the water, there may be an air lock in the circulation pump. In this situation, the impeller of the pump turns, but doesn't move any water. There are several ways to purge the bubble. There may be a bleed valve attached to or near the pump. Open that slowly and listen for the release of the air. Alternatively, you can force the bubble out of the pump by removing the filter, and putting the hose you use to fill the spa down into the opening for the filter. Turn on the water and force water through the circulation system. You should see some air bubbles coming up in the hot tub. Too many closed jets Most hot tubs are equiped with variable flow jets. If too many jets are set to the "closed" position, the back pressure can trigger a flow issue. Verify that the jets are open. The most likely problem is a defective capacitor. If your circulation pump is a two-speed pump, you can try pushing the jets button to put the pump in high speed. If the pump runs in high speed, but not in low speed, then it is very likely that the smaller capacitor needs replacing. If you have a single-speed pump as your circulation pump, you can try to manually start the pump with a screwdriver in the back. With the power on to the pump, give a quick twist to put the impeller in motion. If it continues to run, then the capacitor is faulty. The pump is turning, but there is no flow If the pump makes normal noises, but there is no water moving through the system, then it's possible that the impeller is broken. You'll need to disassemble the pump's wet end to verify. If the pump isn't working at all, working for a short time, then stopping, it could be time to replace the pump. First make sure that none of the problems above apply. The most likely reason for a flow error is that there is a problem with the flow. of water through the heater. If the problem still persists, and you can verify that there is a strong flow of water through the jets, then it may be a problem with the detection system itself. Find the flow detection system, if you have a pressure switch , or a flow switch, start by cleaning the electrical contacts. Restart the spa and see if the error persists. If you are still struggling with flow errors after trying these solutions, it's probably time to get in touch with us or a local spa repair person.